Terminated Contracts are part and parcel of the real estate industry. In recent months, we know many agents have been left feeling they are experiencing more than their fair share. At KRG Conveyancing, we have formed property market insights across market cycles during our 20 year history. We would like to share with you some of our recent data collected regarding contract terminations. We have seen first hand the impact that the Banking Royal Commission has triggered over the past 6 months. 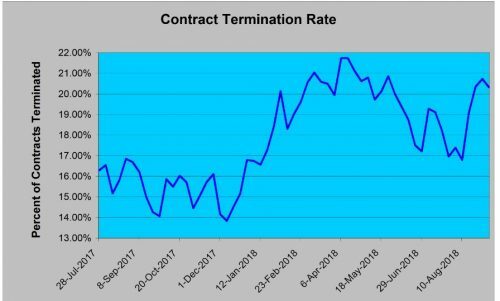 During this period, our contract terminations jumped from around 15% to over 20% which is well above our historical average. We anticipate that this trend will soon settle down closer to the longer term average as adjustments are made by clients, finance brokers and lenders. Tip: In the meantime, many sellers may be well advised to carefully consider the certainty benefits of a cash unconditional contract over a contract that is subject to finance, even at a lesser price. To assist agents and clients negotiate and enter contracts (including any special conditions) with confidence upfront, KRG Conveyancing offers a free contract review service by our team of expert property solicitors. And in recognition of the frustration and disappointment involved when the Contract terminates for any reason, we do not charge any professional fees if the contract terminates.